Crafted with superior quality, complemented with rich vibrant colorful colors, and accentuated with sparkling jewels on its body, this gorgeous big bejeweled cloisonne rooster statue makes a perfect ornament for a desk, room, office, home, etc. Big rooster statue is commonly recommenced by feng shui practice as one of the most powerful feng shui cure or enhancer. Since metal rooster can dissolve problems of the office politics and solve the competition in work or commerce to ensure a final victor. People would like to display one feng shui rooster in office to ward off argument energy if there are some gossips among colleagues. 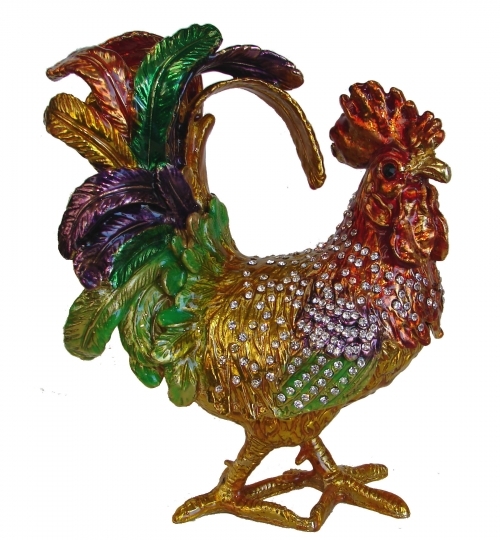 The bejeweled big metal rooster figurine is made of cloisonne and approx. 5 3/4" in length, 3" in width and 7 1/2" in height.